How much coconut juice is in CocoWater? An equivalence of 2 coconuts for 473ml bottle and an equivalence of 1 coconut for 25oml bottle. We also add Vitamin c to help preserve our CocoWater, in addition to sterilization. How many calories and sugar per bottle? There are 80 calories per 8oz serving. For Pure, there is 13 gram of sugar and for CocoWater, there is 18 grams of sugar. Are coconut water and coconut milk the same? If not, what are the differences? No, they are not the same. Coconut milk comes from coconut meat while coconut water is natural juice inside coconuts. Coconut milk is very high in fat while coconut water has no fat and is very low in calories. In addition, coconut water has potassium and magnesium and so, coconut water is a much healthier choice. Coconut water is great for people with acid reflux. It has just the right amount of sugar to control diabetes. And it detoxifies the digestive system helping you to lose weights and speeding up metabolism. It is also a great source of potassium and it is very low in fat and calories and has no cholesterol. Coconut water is an isotonic beverage. What does that mean? It is the same as a sports drink which people drink so they can replace body’s fluid and electrolytes that they lose after a long period of exercise. Will there be the same benefits in 250ml bottle as in 473 ml bottle? Yes, all the benefits stay the same. 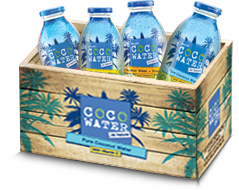 Are there any plans to add coconut pulps to CocoWater? Sorry, but we have no plans for that now. I heard many people drink coconut water after exercise. Which other occasions do people drink coconut water? According to our survey, some people also drink coconut water with their meals or after a long night-out. What are the benefits of having CocoWater in glass bottles? Glass bottles do a better job at preserving benefits of coconut water for you. They keep it fresh for a longer period of time. And they are also 100% recyclable which is good for the environment. After I open a bottle of CocoWater, how long can I keep it before it gets spoiled? We recommend you to keep it refrigerated and finish the bottle within one day. Who can drink coconut water? 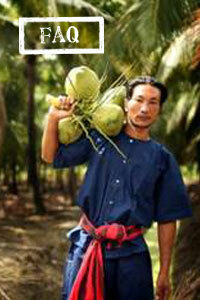 People of any age can drink coconut water, including pregnant women because it is 100% natural and safe. Where can I buy CocoWater products? If you are a consumer, please click here. Interested in doing business with us? Click here. Copyright © 2010-2011 Exoticcocowater.com All rights reserved.